"YALE". 2 1/4" wide. Steel case. Steel shackle. "YALE & TOWNE MFG. CO." is stamped on the reverse of the case. Mfg by: Yale & Towne Mfg. Co.
"YALE". Brass case. Brass shackle. Mfg by: Yale & Towne Mfg. 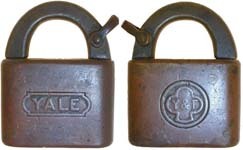 Co.
"YALE" - "YALE". 2 5/8" high x 2" wide x 13/16" deep. Brass case. Steel shackle. 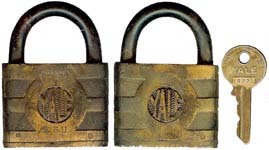 This is an early master keyed padlock. Mfg by: Yale & Towne Mfg. Co. US Patent #912773. 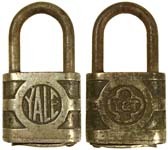 "YALE" - "Y&T" Trefoil. 3 3/8" high x 2" wide x 13/16" deep. Brass case. Steel shackle. Mfg by: Yale & Towne Mfg. 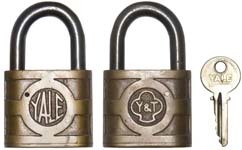 Co.
"YALE" - "Y&T" Trefoil. 2 7/8" high. Brass case. Steel shackle. Dust guard. Mfg by: Yale & Towne Mfg. Co.